Monday; April 22, 2019. Temperature 30.6F at 6:30a. Humidity 90%. Wind 2.2 mph from the North, North-East. Barometric Pressure 29.68 and rising. Light snow in the air and a heavy dusting on the ground this morning. Tuesday; April 16, 2019. Temperature 30.2F at 6a. Humidity 85%. Wind 2.4 mph from the East, South-East. Barometric Pressure 29.31 and falling. Snowing light and steady. 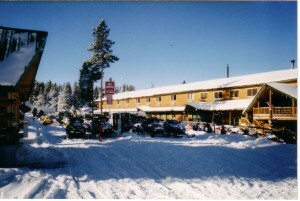 VINTAGE RACE DAY TODAY – Elk View Inn Saturday; April 13, 2019. Temperature 18.4F at 5a. Humidity 76%. Wind 0.4mph from the South-West. Barometric Pressure 29.39 and rising. Tuesday; April 9, 2019. Temperature 38.7F at 5a. Humidity 79%. Wind 9.8 to 10.2 mph from the South, South-East. Barometric Pressure 29.35 and falling. Light steady rain with forecast showing changing to snow. Sunday; March 31, 2019. Temperature 17.1F at 7:03a. Humidity 79%. Wind 0.1 mph from the South, South-East. Sunshine. Clear Sky. Wednesday; March 27, 2019. Temperature 24.1F at 6:15a. Humidity 69%. Wind 0.1 mph from the North, North-East. Approximately three (3″) inches of new snow at the lodge in the past 72 Hours. LOOKING FOR THAT UNIQUE AND SPECIAL GIFT YEAR ROUND? WE CAN EMAIL YOUR GIFT CERTIFICATE! Call Roberta or Melodie at 307-752-5444 or 307-752-8444.